Barcelona is such an amazing city that can offer pretty much everything for all type of travelers, from adults to children alike! Visiting Barcelona with kids? Definitely a great idea! There are so many things to do with your family in the city! 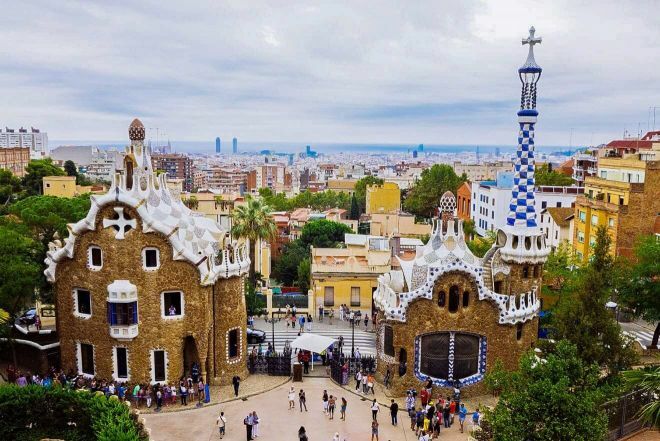 From the famous Sagrada Familia and Casa Batllo to amusement parks, museums and family tours in Barcelona, the city provides endless fun and a never-ending list of things to do! If you will prepare in advance, you will definitely not miss out the most colorful and fun places in the city. 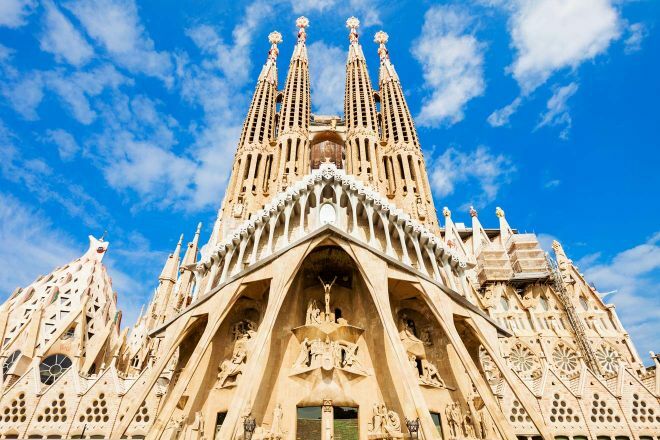 Sagrada Familia is the most iconic attraction in the entire Barcelona and your kids are going to like it a lot, especially if you are going during sunset! While you enjoy the stunning interior of Antoni Gaudi’s masterpiece, your kids can share the audio guide or just wander around and admire the stunning architecture. Pre-book your tickets if you want to visit Sagrada Familia while skipping the long line and saving some money. The entrance fee is 17€ for adults, children under the age of 11 can enter for free. NOTE 1: For safety reasons, children under the age of 6 are not allowed up the Towers of Sagrada Familia. NOTE 2: Starting 2019, the tickets for skip-the-line to Sagrada Familia are only available starting 2 PM. If you want to go earlier, you might want to consider a guided tour. 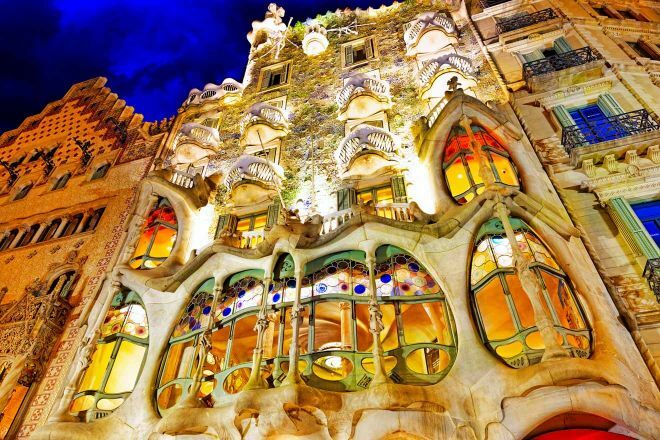 If you are going to visit Casa Batllo with kids, you will definitely make their visit unforgettable by taking a dramatized theatrical tour of Casa Batllo. Either Gaudí himself or Lady Ramoneta – the Batlló family’s housekeeper – will show you the nooks and crannies of the house and tell you unforgettable anecdotes! NOTE: The theatrical tour takes place only on Sundays and children under the age of 7 can enter for free. The price for adults is 37€. Why is it not my favorite? Because it is excessively touristy, the restaurants are overpriced and one of them even won a prize as the worst restaurant in Spain. By the way, I recommend you do not eat in the Las Ramblas area because, due to high demand, all the food is frozen there. La Boqueria (meaning “butcher”), which is just around the corner, is one of the best markets in Barcelona and a much better place. You will find all kinds of food there – and everything is fresh! Once you go inside, you will be surrounded by a riot of noise, colors and smells. 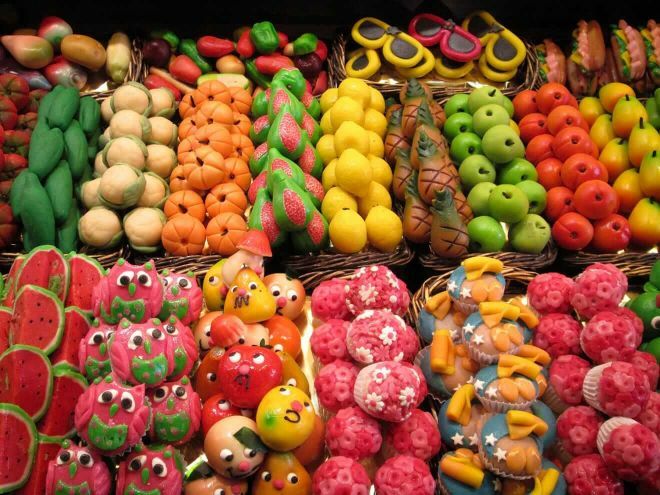 Mouth-watering displays of fruits, vegetables, exotic fish, ham and cheese – in short, an absolute eye candy! I suggest you take a break at one of the bars and treat yourself with a snack, your kids will love a colorful smoothie! The show is accessible, fun and it has a special place on my list of top 10 things to do in Barcelona with kids! I remember I myself jumped with excitement the first time I saw the Magic Fountain Show in Barcelona, so I can only imagine how happy the little ones will be! The unique show of water, lights, and music is an unforgettable experience for adults and children alike! The Magic Fountains are located at Plaça d’Espanya and there is an evening fountain show every day. You can check the updated schedule here. 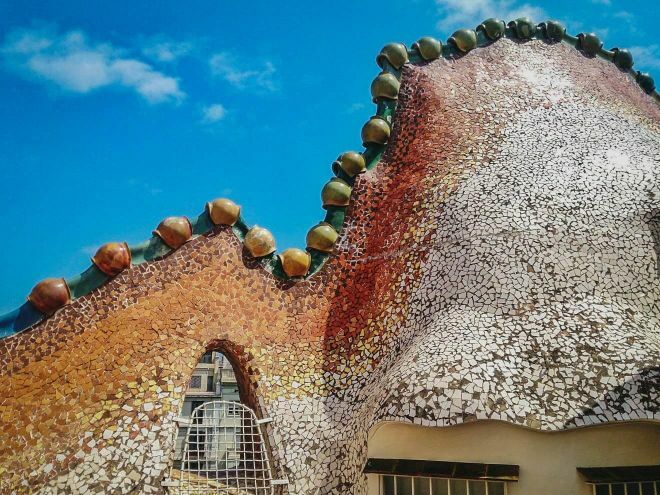 In case you want your child to learn many fun things about Antoni Gaudi during their vacation, here is a great idea of what to do in Barcelona with kids! Park Guell is another one of Gaudi’s masterpieces and truly a very nice experience for your children as well! Your kids will truly feel like in a fairy tale because of the “Hansel and Gretel” style houses! Please note that the place might be quite crowded, but you can avoid all the hustle and make your visit enjoyable by reading this article about how you can skip the line to the most important attractions in the city. Don’t forget to enjoy and walk around in the free area after your visit as well! NOTE: Children under the age of 6 can enter the monumental area free of charge. The ticket price for adults is 8.5€/person. How about taking your kiddos to the most famous park in the city? Ciutadella Park is nothing but boring, as it has row boats, fountains, play areas and even a full-size replica of a mammoth! 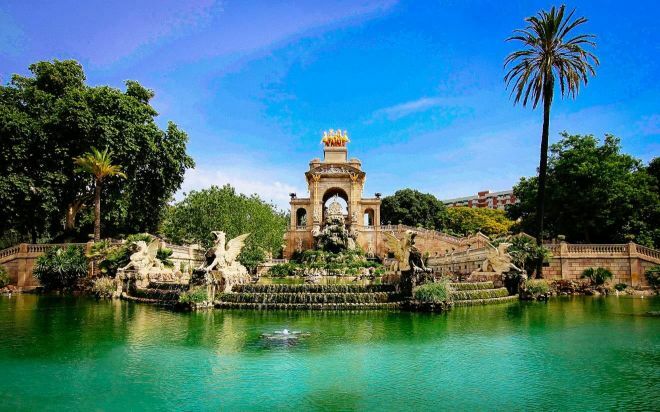 It is always a good idea to make a picnic there and spend some calm, quality time with your family in Barcelona! The Zoo (below in this list) is located inside this park too, but it has a separate entrance with a ticket. 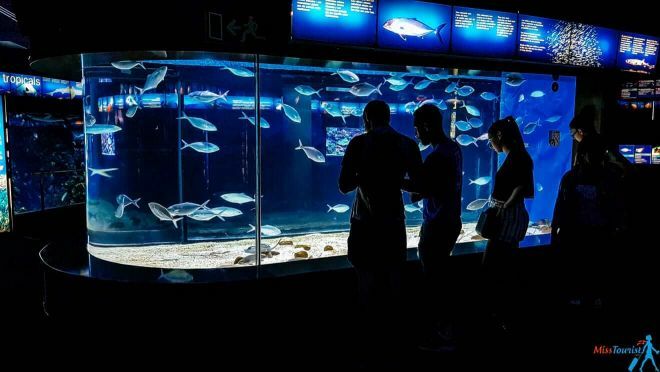 Did you know that The Aquarium of Barcelona hosts Europe’s largest sea tunnel? In the summertime, the Aquarium is open until 9 PM, but I recommend visiting in the morning or afternoon to see the shows. There are generally no queues, but I still recommend buying your tickets online beforehand. There are different prices for adults (20€), children from 5 to 10 years old (15€), children between 3 and 4 (7€) and there is even a family pack for 2 adults and 2 children that you can buy for 60€. You can book your tickets in advance here. NOTE: Birthday parties for children aged 3-10 can also be organized at the Aquarium! Now, this is probably one of the most appealing attractions in this entire list for kids! At Museu de la Xocolata, your children can learn and see how chocolate is made and they can walk near various sculptures made entirely of chocolate. And the best part? They can taste it, of course! So, for example, the weather is bad and you are searching for some cool indoor things to do in Barcelona, this is definitely the place to go! The entrance fee is 6€ for adults. Kids under the age of 7 can enter for free. If your kids love chocolate (there is probably no “if” in this sentence), you can also take a chocolate tour for families. While your kids indulge their taste buds with chocolate and sweets in different shops, combined with blindfolded sweets tasting and scavenger’s hunt, you can have some well-deserved parent rest. If you want to do some Barcelona sightseeing with your family, this is the perfect place to go! Montserrat is an unusual looking mountain, located very close to Barcelona. 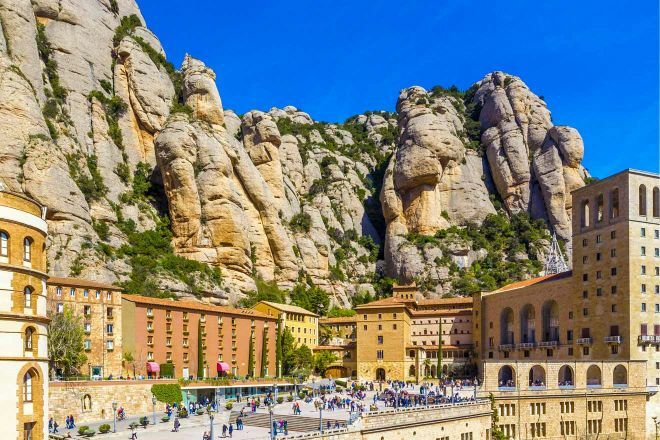 Up there you can find Montserrat monastery and a museum and I can say that visiting the open-air museum with kids is definitely a great idea! They will enjoy the epic views, the cable cars and the choir of boys in the monastery! You can find more information about prices and how to get there is in this post – Barcelona day trips out of the city. I promise your kids will remember this vacation for many years if you take them to one of the biggest adventure parks in Europe that is located very close to Barcelona! Port Aventura park offers rides for all ages – from super cute Sesame street rides for 3-year-olds to thrilling rides for teenagers (and yourself, why not?). It also has the fastest and tallest ride in Europe, so it is definitely one of the best things to do with kids in Barcelona! 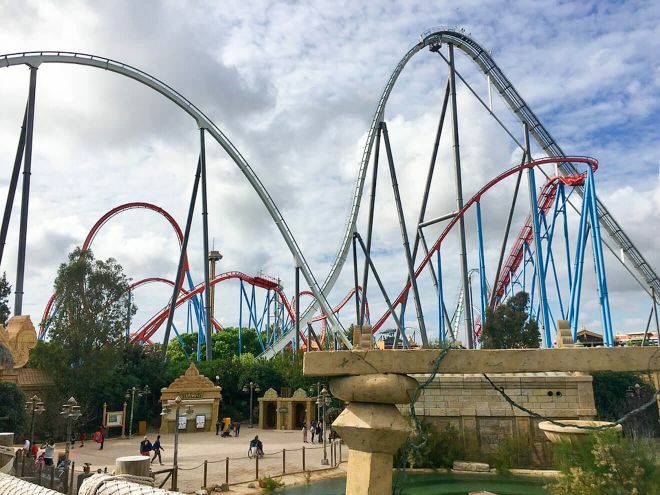 NOTE: You can get a very good deal for a Port Aventura and Ferrari Land day trip with transportation included, or a 20% discount if you are a Barcelona City Pass Holder. Here is an awesome challenge: try to find your way out of this labyrinth park with your kids! 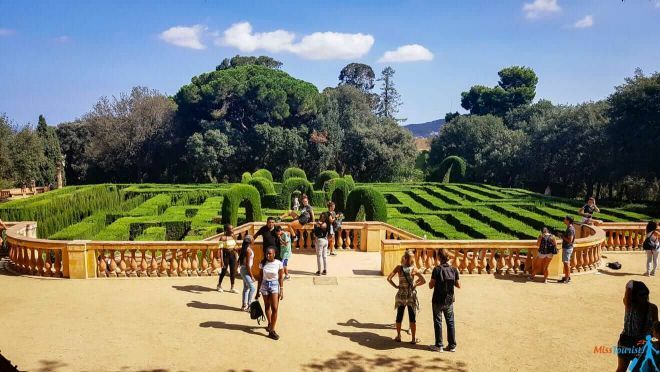 Parc del Laberint d’Horta is hardly known by tourists at the moment, which makes it a perfect spot for lunch or just some relaxation. Oh, and did you know that a famous scene from “Perfume – The story of a murderer” movie was captured there? Besides the beautiful, green labyrinth, the park has a beautiful 14th-century house, a waterfall and many alleys where you and your kids can stroll around! The entrance fee is 2,17€/adult, except for Wednesdays and Sundays, when the admission is free. Children under the age of 5 can enter for free any day of the week. If you would like to visit the entire country of Spain but you do not have enough time, you should stop by Poble Espanyol! 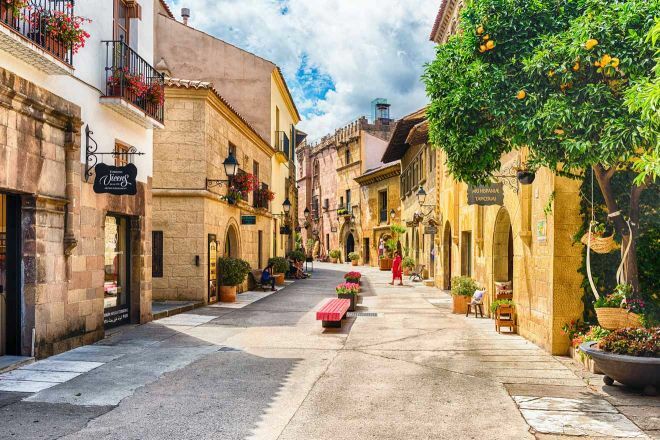 Poble Espanyol is an open-air architectural museum in Barcelona that will give you an understanding of authentic Spanish cuisines, crafts and the types of architecture in different regions of the country. Located in a calm place with no traffic, it is ideal for both children and adults! There are some amazing workshops held there, where your kids can learn how Spanish people produced crafts back in the days! The price at the door is 14€ for an adult, 7€ for a kid and 36€ for a family of 4. You can get it for 12,60€ here if you buy your tickets online (cheaper than on the official website!). Also, you can get a 20% discount if you are a Barcelona City Pass holder. NOTE: Not many people know this, but after 8 PM you can get an evening ticket for only 7€ (you can only buy it there on the spot)! It is going to be darker, indeed, but the whole village is nicely illuminated, so it is an interesting experience to try. There is also a video guide available (+3,5€), but I remember that, when I visited, it did not have headphones included. You can take your own with you or listen to the information without it, although sometimes it can be hard to hear. Poble Espanyol is open 365 days a week, on Fridays until 3 AM, and Saturdays until 4 AM (this is unbelievable for Spain!). You can check the updated schedule here. If you are having a Barcelona family holiday during summer, then enjoying the Mediterranean sun on a beach is a very good idea for everyone who enjoys this type of activity! La Barceloneta beach is the easiest one to reach, but keep in mind it is also the most crowded. The Olympic Village beach is also one of the good family beaches in Barcelona because it has a “spider web” of structures that the little ones can climb and even a playground! Nova Icaria beach is one of the quietest and family-friendly beaches in Barcelona, while Bogatell beach has a fun little playground for the little ones, as well as table tennis, basketball and beach football! NOTE: Whichever beach you choose, please do not leave your belongings unattended, as the pickpockets are professionals in Barcelona! 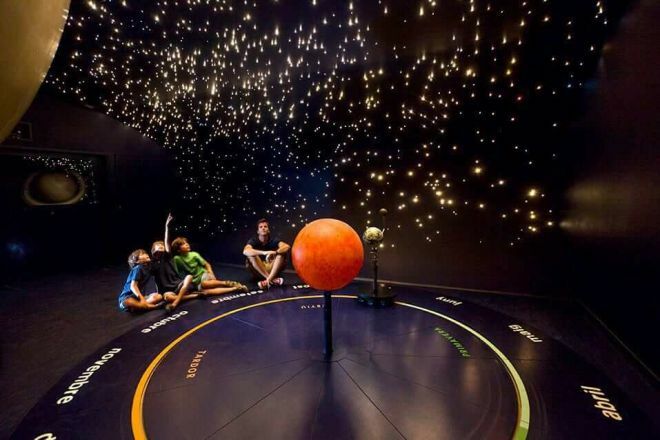 Your kids can go ahead and touch everything in CosmoCaixa Barcelona, as curiosity has no limits here! This is a science museum and it is designed to stimulate people’s knowledge of science through interactive exhibitions and fun activities. Sounds perfect for the little ones, right? Make sure you do not miss the Flooded Forest, the Geological Wall, the Room of Matter and the Planetarium! The normal price is 4€ for adults, but you can find a cheaper option for 2.50€ here. Children under the age of 16 can enter for free. Booking in advance is essential. This Barcelona tour is specially designed with 4 to 12-year-olds in mind. In short, this 2.5 hours walking tour will give them a chance to explore the legends of Barcelona’s Gothic Quarter, visit traditional workshops, yummy candy stores and much more! I truly believe this is one of the top 10 family things to do in Barcelona, as you will get to spend some quality time together, while also discovering this unique city! If this sounds like the perfect tour for your kids, you can book it here. 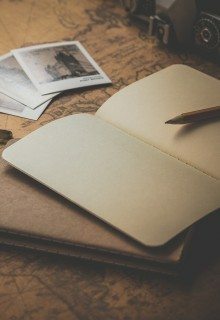 If you want to see all the highlights of Barcelona in a very unique and unforgettable way, I suggest you read this article. The Double-Decker tourist bus is probably the easiest way to get around the city with kids. Not much walking is required and you can stop wherever you want and then re-board the bus to continue your journey! The kids will love looking at the attractions from the second floor of the bus, feeling the wind and watching the trees that line the avenues! 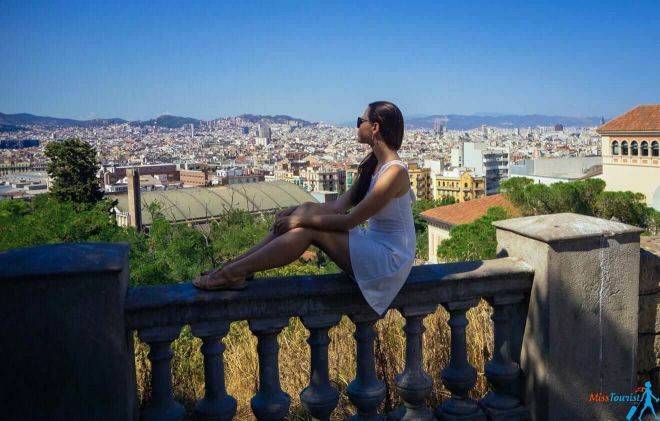 Plus, if you don’t have a lot of time in the city but you still want to experience it to its fullest, this is one of those very good, last-minute things to do in Barcelona! 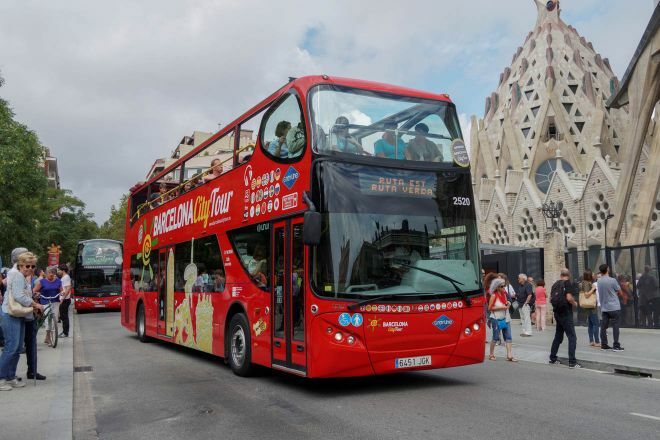 Remember, there is also a great money-saving tip for those using the Hop-on bus – you can get a Barcelona Pass that includes the Hop-On Hop-Off Bus, a skip-the-line-tour to Sagrada Familia, Park Guell fast track, the transfer to and from the airport and 20% discount to numerous attractions. 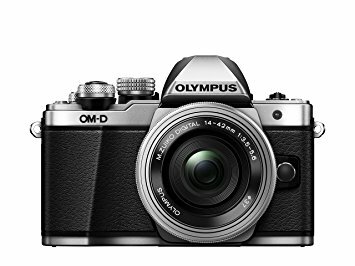 This is a REALLY good deal and I definitely recommend it. Check it out here. NOTE: You will find many discounts if you take a map provided by the Hop-on/Hop-off bus. It is usually 20% or a couple of euros off for the most popular attractions in the city. It may not sound like much, but it adds up if you want to visit many things and if you are traveling in a large group/family. Remember – you will get one booklet with discounts per person! 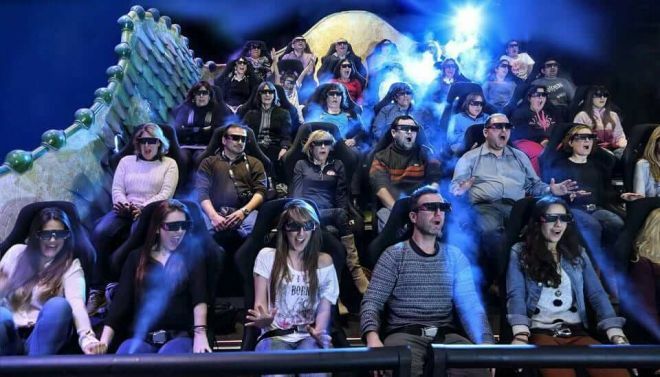 If your children are older than 6 years old, you can take them to G Experiencia for a thrilling ride where they will virtually fly over Sagrada Familia and see all other important Gaudi sites in Barcelona in 4D! It’s super modern and exciting and one of the top things to do in Barcelona with your family! NOTE: There is also a special kid’s area there, where they can play and learn everything about the Spanish architecture genius and the Barcelona landmarks. Hop on a cable car to enjoy some panoramic views over the rooftops to the Pyrenees, beyond the sparkling Mediterranean Sea! We went on a Saturday and we had the cable car just for ourselves! The price is 12,7€ roundtrip for adults and 9.20€ for kids – you can check the updated prices here. 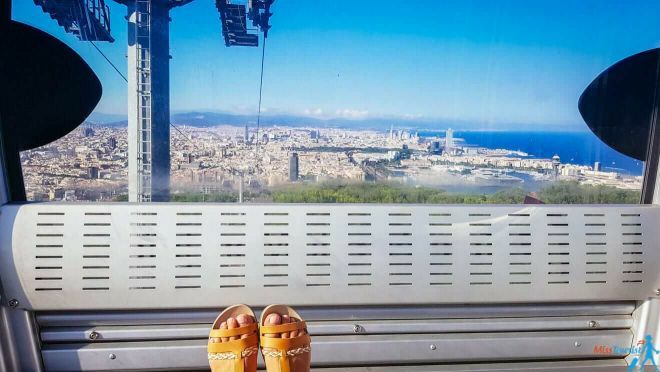 I am sure your children will enjoy running around on the Montjuic Hill, while you enjoy fantastic views over the city – this is definitely one of the most relaxing Barcelona children’s activities that you can try! The citadel of Monjuic is also highly recommended to visit! The entrance is 5€/adults, 3€/students and free for kids up to 16 years old. NOTE: On Sundays, after 3 PM everyone can enter free of charge! Looking for even more fun things to do in Barcelona? 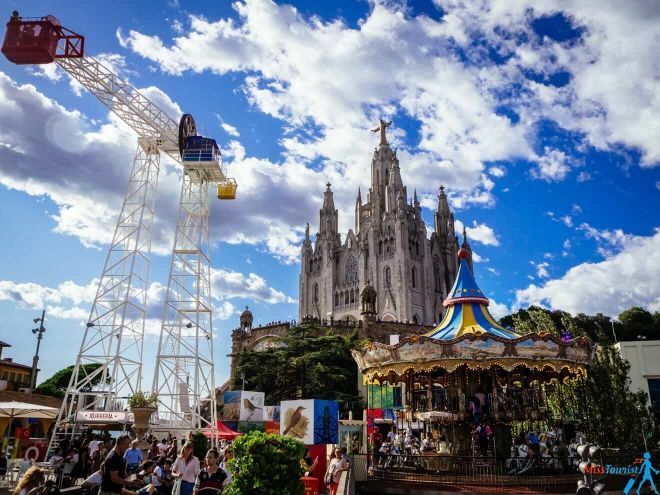 Tibidabo Park is so charming and vintage-looking, that it will bring you back to the 70s! But don’t let this mislead you – all of the attractions are safe, some of them are even brand new and they adopted this old-style especially. While you are there, you can hop on the magical carousel, thrilling rides or sparkling Ferris wheel to check out some of Barcelona’s incredible panoramic views. To get a 5% discount, you can buy tickets online in advance here. 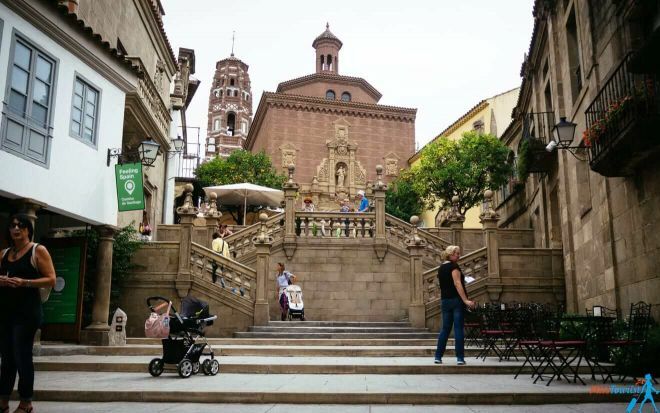 Oh, and do not forget to visit the Cathedral and walk around the residential area a little bit, it is adorable and your kids will surely enjoy it! Many children love going to the zoo, and the one in Barcelona is especially impressive! Enjoy the wildlife in Barcelona Zoo that hosts 2.000 animals of around 300 different species. I recommend visiting the zoo in the morning when they organize activities dedicated to kids from 4 to 11 years old where children will see how the dolphins are fed and meet a zoo vet. Plus, you can organize your kid’s birthday party there! Most open activities are scheduled for the weekends and holidays and you can check the schedule here. Make sure to take some lunch with you (or you can buy it inside), as there are many pretty lunch spots where you can relax with your family! You can book your tickets for this Barcelona family attraction on their website in advance with a 10% discount here. The discounted price is 19.26€/adults and 11.65€/children. Kids under the age of 3 can enter for free. 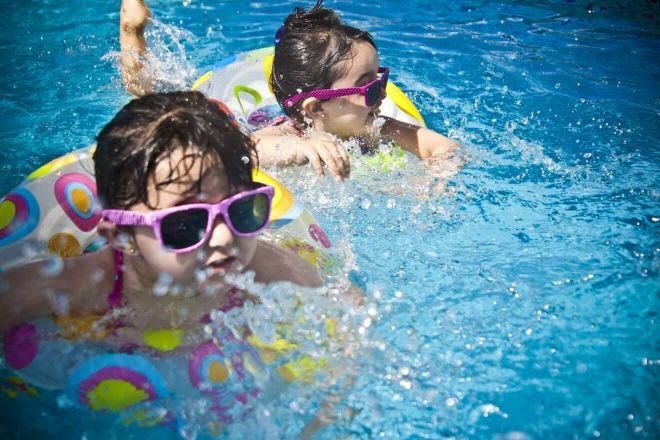 If you are visiting Barcelona during the summer, it will be a fantastic idea to refresh in a cool water park with your kids! 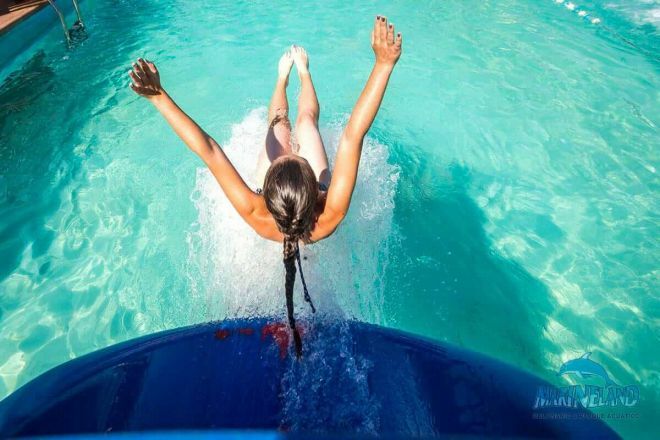 Illa Fantasia is a water park near Barcelona with 22 attractions and 3 macro swimming pools. Enjoyment for the whole family is guaranteed there! The prices are 28€/adult and 17€ for kids shorter than 1.20m. If your son/daughter is shorter than 90 cm, he/she gets in for free! You can buy your tickets on the official website here. If you have boys (or daughters that are into football), it would be very exciting to take them to one of the soccer games, as they are very safe for people of all ages! The stadium is huge, but tickets get sold out fast. Make sure to buy your tickets in advance! 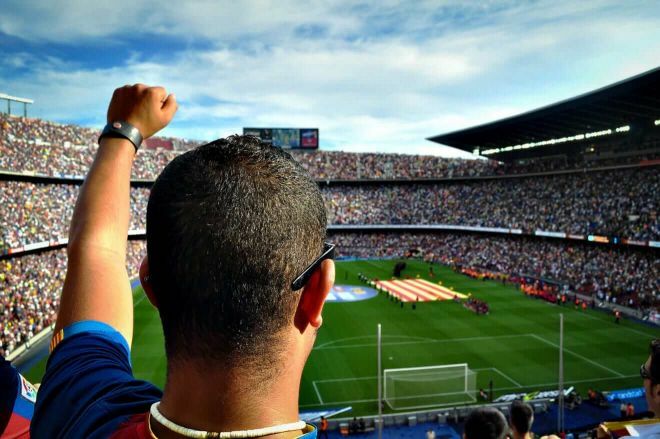 Alternatively, if the matches start too late for your kids to attend, you can always take them for a tour of Camp Nou – it takes place during the day and there are no crowds of football fans! Another great water activity, Marineland is a family water park with slides and splash pools for children. Moreover, it also features some amazing dolphin shows and exotic birds exhibitions. NOTE: It takes about 1 hour 30 minutes to get there from Barcelona with a free bus, so it is quite a ride that is not recommended for very small kids. The online price is discounted and it is 25€ for adults, 16€ for children from 5 to 10 years old and 10€ for kids from 3 to 4 years old. You can also buy a family ticket (2 adults and 2 children) for 80€. You can buy your tickets online here. How does a miniature theme park sound to you? 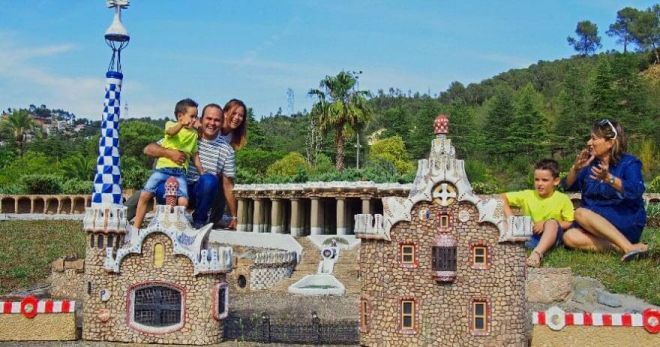 You will feel just like a giant at Miniature Catalonia Park! Your kids will be able to climb on the gingerbread houses from Park Guell, touch the peaks of Sagrada Familia and the entire place offers endless fantastic photo opportunities! It’s basically like a kid’s indoor playground in Barcelona! This attraction is located outside the city and you can find all the information about prices and how to get there on their website here. 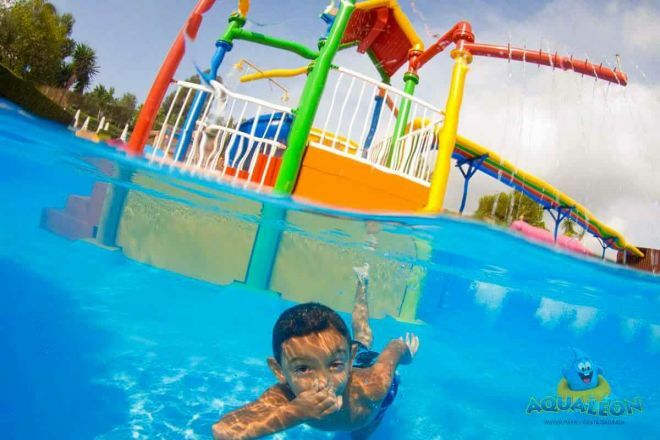 Yet another fun and relaxing water park, Aqualeon offers unlimited fun to adults and kids alike with pools, giant slides, tunnels and a bus safari tour that passes by lions, tigers, and bears! The park opens in June and the ticket prices are 27.5€ for adults, 18.5€ for children (5 to 10 years old) and 10€ (3 to 4 years old). Plus, children under the age of 2 can enter for free! To get there, it takes about 1.5 – 2 hours from Barcelona and the bus is 6€ roundtrip per person. Discovering the beautiful and sunny city of Barcelona on a bike can be a great activity to do together with your family! There are many bike tours available in the city, but here I am recommending two good ones: you can either choose a 3.5-hour bike tour with a break on a beach terrace or a 3-hour tour where you will see the main landmarks! Hotel Pullman Barcelona Skipper is a 5-star establishment located in the city center and one of the best family-friendly hotels in Barcelona! It is situated within walking distance from the beach, so if you are traveling with your eager to swim children, this is the perfect location. Another great place to stay with your children is Ca La Maria Barcelona, which offers a wonderful terrace on which you can spend quality time with your family. It is located near the famous La Rambla Street. Ella Guest House Barcelona is a wonderful accommodation option that disposes of a nice terrace where, at night, you will hear the birds sing. You can hardly believe that you are in the middle of Barcelona! Another option to be taken into consideration is Hostel Martinval, which is definitely one of the best child-friendly hotels in Barcelona, as you will not need to walk large distances on foot to reach the top tourist attractions. Pension Mariluz, which is situated in the Gothic neighborhood of Barcelona and has been reviewed by past guests as the perfect choice for a wonderful vacation. Another great budget choice for your vacation is Suites Marina – Abapart, which puts at the disposal of its guests an apartment equipped with every household item you would need to make you right at home. 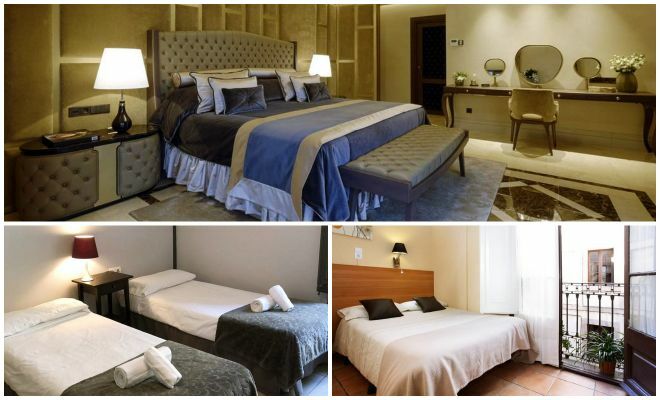 It is situated a couple of hundred meters from the famous Sagrada Familia. 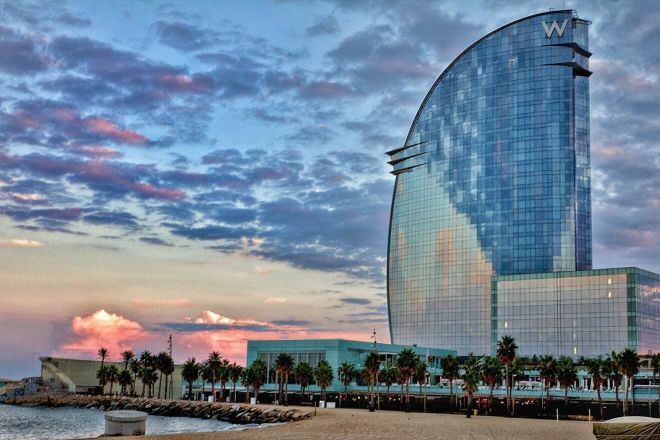 If you are still looking for a hotel in Barcelona, I have this post where I recommend great accommodation for certain areas and prices. RELATED READ: 5 Neighborhoods to stay in Barcelona and best hotels recommendations for each! 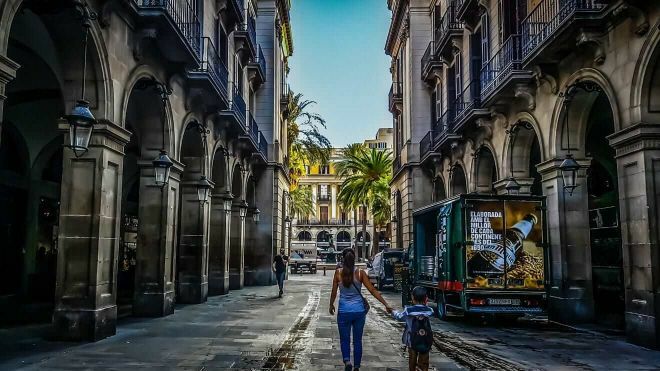 Barcelona is one of the best and most popular cities in Europe, and visiting it together with your kids can only be a wonderful experience for the entire family! There is so much to do and see in Barcelona with children, especially because it is such a safe and kid-friendly city! 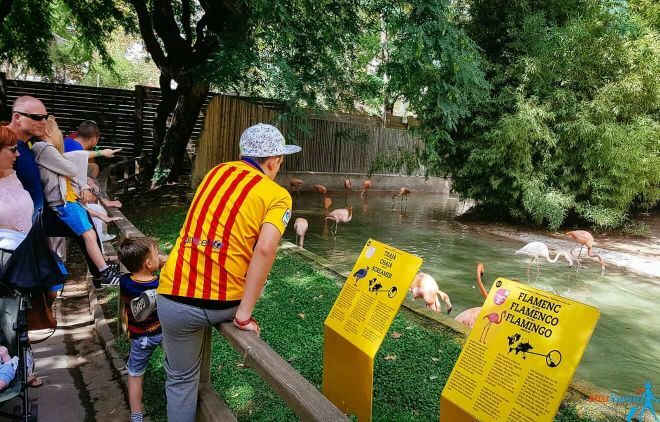 In this list, I combined the best family activities in Barcelona that I am sure will be super interesting and exciting for your kids. Plus, all of these activities will embrace the incredible Catalan culture at the same time, so they will definitely learn something new during their Barcelona holidays! I hope you will have the time of your life in the capital of Catalonia! I wish you will have a fun family trip to Barcelona! Please let me know in the comments if you have any questions, I will be happy to reply! Barcelona Passes: Which one is worth the money?